What are the symptoms of a ICP Blower Wheel not working? A bad blower wheel can become out of balance and may shake the furnace/air handler. This can also place a strain on the blower motor bearings. Additionally, fins can fly off or the hub weld breaks and causes a lack of airflow and/or grinding noise. Lack of airflow can cause the furnace to go off on high limit during a call for heat, or cause the evaporator coil to freeze over during cooling mode. 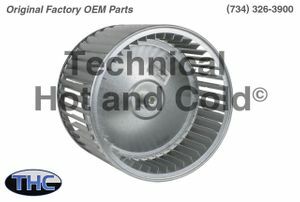 Technical Hot and Cold offers the ICP 96319 Blower Wheel OEM replacement part for sale online and over the phone. Call (734)326-3900 to speak with a technician for additional information on each ICP replacement part.